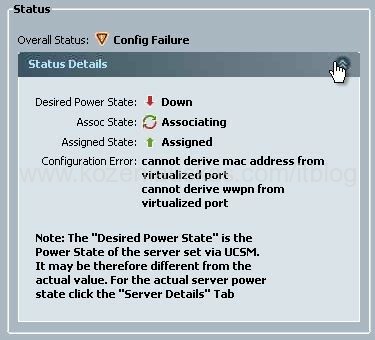 N1Kv# 2014 Jun 1 18:34:48 N1Kv %VMS-1-CONN_SSL_NOAUTH: SSL AUTHENTICATION failure. 2014 Jun 1 18:37:48 N1Kv %VMS-1-CONN_SSL_NOAUTH1: SSL AUTHENTICATION failure. 2014 Jun 1 18:40:48 N1Kv %VMS-1-CONN_SSL_NOAUTH: SSL AUTHENTICATION failure. 2014 Jun 1 18:43:47 N1Kv %VMS-1-CONN_SSL_NOAUTH1: SSL AUTHENTICATION failure. 2014 Jun 1 18:46:47 N1Kv %VMS-1-CONN_SSL_NOAUTH: SSL AUTHENTICATION failure. 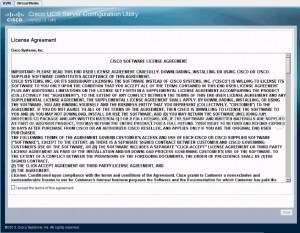 The Cisco Nexus 1000V VSM can validate the certificate presented by vCenter Server to authenticate it. The certificate may be self-signed or signed by a Certificate Authority (CA). 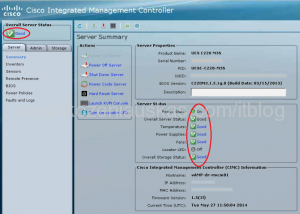 The validation is done each time the VSM connects to the vCenter Server. If the certificate authentication fails, a warning is generated but the connection is not impaired. This is an optional feature. To get rid of the warning please generate a valid SSL certificate for vCenter server. Nexus: Pre-upgrade check failed. Return code 0x40930062 (free space in the filesystem is below threshold). Pre-upgrade check failed. Return code 0x40930062 (free space in the filesystem is below threshold). As you can see the problem is because /var/tmp is bellow the threshold. 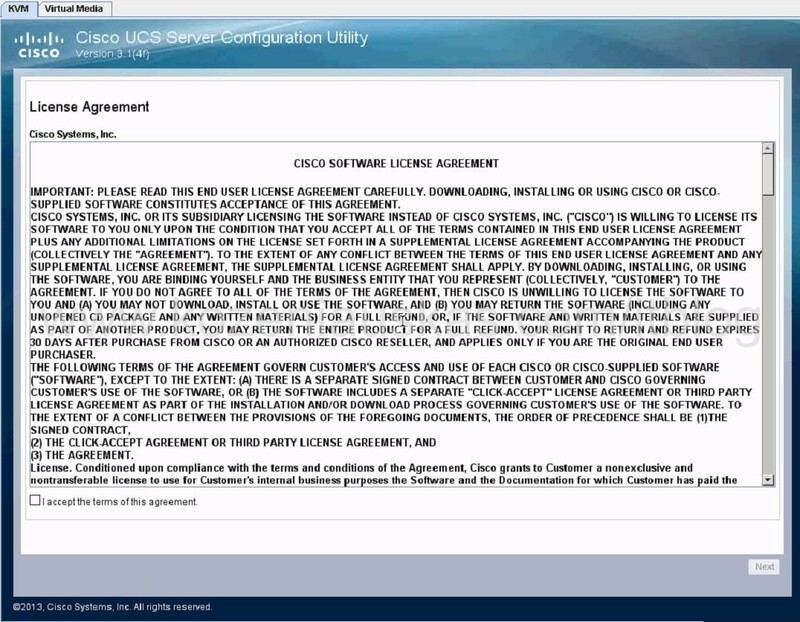 Cisco has release a field notice FN – 63812 on 4th of June for their servers that are using Seagate hard drives. 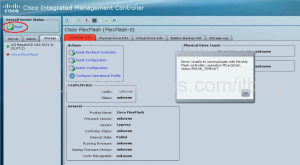 According to Cisco some Seagate drives with specific level of firmware might not respond to requests. There is a list of drives and instructions how to identify these drives. Unfortunately if you have C220 M2 server with integrated controller like LSI 1064E the instruction are not going to work as the drives are not visible in CIMC. Trying to Acknowledge or Remove Chassis is not successful. 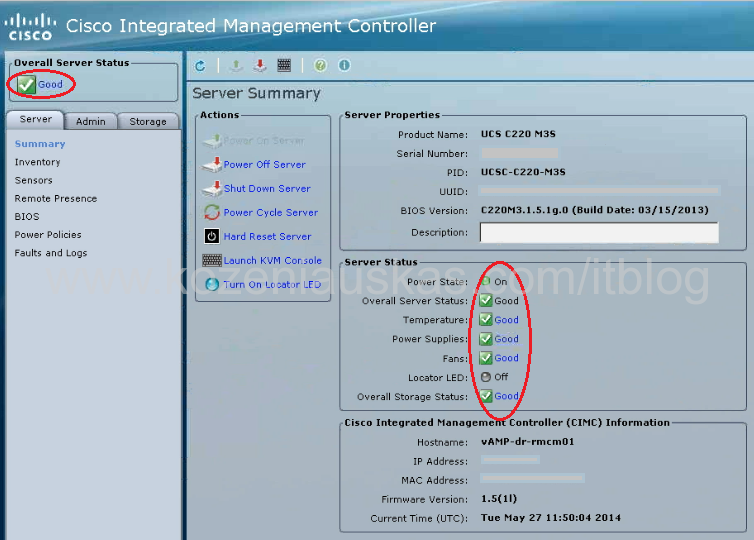 UCS Server Configuration Utility (SCU) allows user to configure the server and also run diagnostics tests. 5. 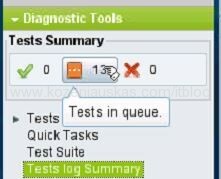 In SCU expand Diagnostic Tools, select Quick Tasks and choose the test you want to run Quick or Comprehensive. 7. You can see the status of the tests under Tests Summary and the results under Test log Summary. The errors can be rotating but it is stuck at 4%. 1. Check Firmware versions and see if all are as expected. 2. Reset CIMC and after this is done Reacknowledge the server. 4. Activate the Board Controller with correct version and wait until activation is finished. UCSPE 2.2(1bPE1) is out. Get it here. 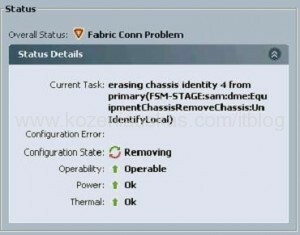 After associating service profile to a blade it gets stuck in EFI Shell and association can not complete. The problem could be because the service profile does not have all the required configuration. Have a look at Status under General tab to see what is the error. In this case there were no MACs or WWPNs defined. CNA cards must have these defined as they do not have them burned in.